Gordon Carroll was an editor and publisher of magazines that were famous in their day. Today, however, more people would probably recognize the work of his son than the covers of his magazines. 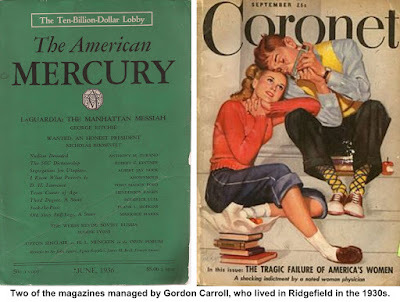 In the 1920s and 30s, The American Mercury was a leading magazine of contemporary literature and thought. Its founders included the book publisher Alfred Knopf and the journalist H.L. Mencken — Mencken edited and wrote for the magazine for many years. The American Mercury published such writers as F. Scott Fitzgerald, William Faulkner, Eugene O’Neill, Carl Sandburg, Thomas Wolfe, Ford Madox Ford, W.E.B. Du Bois, and William Saroyan. In 1936, Ridgefielder Carroll became managing editor of The American Mercury — and even published it for a while from offices on Main Street. Gordon Carroll was born in Baltimore in 1903, graduated from Baltimore Polytechnic Institute in 1920, and studied from 1921 to 1923 at the University of Maryland. He began his career as a reporter for The Baltimore Sun and went on to work for The Washington Post, The St. Louis Post-Dispatch, and The New York Sun. At the time, Carroll was living on Barry Avenue and for a while ran the magazine in the “Keeler and Durant Building” that still stands on the south corner of Main and Governor Street, just north of the Community Center. He left American Mercury and became a senior editor at Reader’s Digest from 1938 to 1941. During the war, he was a publications editor with the Office Civilian Defense, and an editor Time, Inc., from 1943 to 1945. There he produced a compendium of World War II reporting from correspondents of Time, Life and Fortune magazines — it was the first book published by Time Inc. In 1946, he became editor-in-chief of Coronet, a popular magazine published by Esquire, eventually becoming publisher and remaining until 1952. In 1961 Carroll joined Random House editor Bennett Cerf and Famous Artists School co-founder Albert Dorne in establishing the Famous Writers School in Westport. However, after a 1972 expose by Jessica Mitford of the school’s misleading advertising and poor business practices, the school slowly went out of business. For a while Carroll also ran the Limited Editions Club, which had been producing fine-quality, limited edition books since the 1920s. After Ridgefield, Carroll lived in Wilton and finally Weston, where he died in 1978 at the age of 76.